iJDMTOY has a wide variety of tow hole mounts, including vehicle specific license plate brackets, universal fit brackets, tow hole rings, and GoPro mounts as well. You can mount your license plate/tow hook ring on the side of your bumper using the tow hook location so there's no drilling or modification involved! This is a video demonstration on how to install the no drill tow hook license plate mount on a new Audi. If you have a different vehicle, the installation process is still the same! This is iJDMTOY's general guide on how to install the license plate tow hook mount, as demonstrated on a BMW. The installation process would be the same general idea for other cars. This is a vehicle specific tow hook license plate mount for the Hyundai Genesis. Follow the guide and you will have a sweet look on your sporty KDM car in no time! This is a vehicle specific tow hook license plate mount installation guide for the Subaru WRX. Many Subaru WRX nowadays have the license plate tow hook mount so it's about time to join the club! This is an installation demo video on how to install a red racing tow ring on a Subaru BRZ or Scion FRS. This is an easy installation that will only take you a few minutes. This is a video tutorial to demonstrate how to install a GoPro Mount, based on an Audi A4. The GoPro Mount is great for drivers who take their car out on the track or even for regular drivers who want to test out this new accessory. This is a super fun GoPro road test demo that shows what the camera captures when a car is on the track or on a cruise. Most cars are equipped with a tow hook mount that is to be accessed when the vehicle needs to get towed for any reason, but there are other more practical ways to utilize the location and transform the car. For people who want to mount their license plate on the side of their bumper, the Tow Hook License Plate Mount is a great kit to relocate the license plate from the middle of the bumper to the side.. The license plate tow hook adapter has eight different locations you can choose to mount in order to accommodate any sensor related issues. If the bracket is too close to the parking sensor, you can choose the location in the bottom right hand corner. If you still trigger the parking sensor, just unplug/disable that particular sensor only. 2. 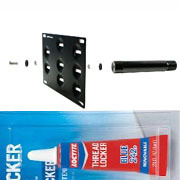 If you want to further secure the tow hook mounting bracket, you can use some Loctite Threadlocker tool. You can get the Loctite tool from Walmart. Just search "Loctite Blue" to find the product. While it is illegal to not have a license plate on the back of your vehicle, it is not a requirement to have a license plate and holder on the front in most states, so most cars do not come with one standard. Because of this, we offer a variety of tow hook license plate mounts to choose from for you to customize your vehicle the way you want to. With a variety of makes and models offered including BMW, Subaru, Lexus, Audi, and more, you will easily be able to find one that fits your vehicle and allows you to add this customization. All of our tow hook license plates offer an easy installation with no drilling or modification required. The mounting bracket is screwed in through the tow area. The brackets have a variety of mounting holes to ensure that lights and sensors are not blocked, and there is an angle adjustment for the plates to follow the curve of the bumper. Because most of these are made to fit a variety of vehicles, there may be some spacing differences depending on the make and model of your vehicle. Depending on the state you live in, it is sometimes required that you have a front license plate in addition to the back license plate. This can be tricky as most cars do not come with that customization available, but with our tow hook license plate options, it is easy to find a solution to this problem. If you live in a state where it’s not required, but still want to customize your vehicle, these products also work for you. Some people have custom license plates created specifically for the front of their cars. Here at iJMDToy, we provide the highest quality automotive lights and parts to help you customize your vehicle to your exact specifications. If you have any questions about our products or your order, please contact our customer service representatives, and they will be happy to help you.